An unknown bidder from Asia spent almost halb a million Euro for this Apple-1 in working condition. On 25th May 2013 this marvelous piece of computer history came under the hammer at Auction Team Breker in Germany. The auction house based in Cologne got 516,461 Euro ($671,400). 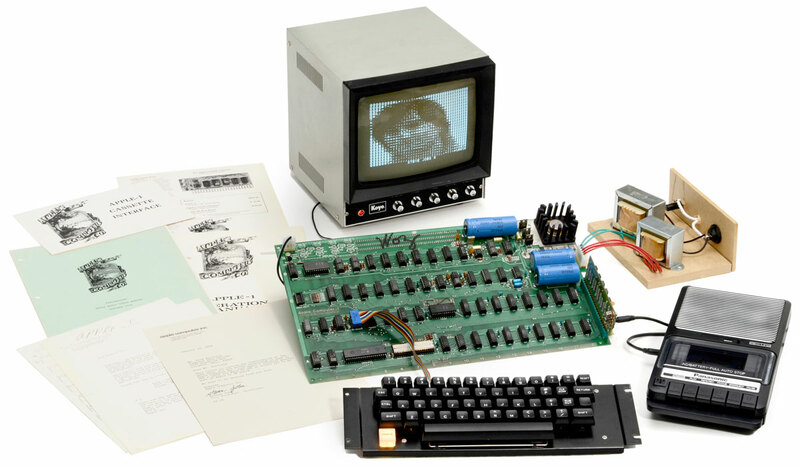 The Apple-1 originally sold in 1976 for $666 (about $2,700 in current dollars). The Apple-1 was designed and handmade by Steve Wozniak, and was marketed in April 1976 by Steve Jobs through electronics retail chain, the “Byte Shop”, which bought the first 50 units. The first Apple computer was delivered as a motherboard only. The peripheral equipment such as power pack, keyboard, monitor and cassette recorder had to be obtained personally by the user. Apple didn’t offer a housing; every user had to make his own. The peripheral items in this auction were authentic and correspond to the motherboard as recommended by Apple. Only 200 examples of the Apple-1 were ever made. According to the Apple-1 Registry by Mike Willegal, today there are only 46 sets in existence worldwide, but just 6 of these are in fully-working condition, and the example offered here was one of those. According to the New York Times the original owner of that Apple-1 was Fred Hatfield, a retired electrical engineer living in New Orleans. Mr. Hatfield attached an image of a letter, dated Jan, 18, 1978 and addressed to him, signed by Mr. Jobs. Mr. Hatfield in New Orleans said he held onto his Apple-1 until earlier this year. Then, a young man from Texas in the software business, whom Mr. Hatfield would not identify, inquired. They negotiated a price — $40,000. The Apple-1, Mr. Hatfield said the New York Times, was not then in working condition. The buyer apparently put in some new chips and wiring, since it was a working model when it sold on 25th May 2013. After picking up the machine, Mr. Hatfield said, the young man flew off to California to get the machine signed by Mr. Wozniak, who designed the Apple-1. That also enhanced its value presumably. Vintage Apple-1 Sells for Record $671,400 – NYTimes.com.